Truly Nitrile exam gloves combine superior comfort, performance, and protection with reduced potential for skin irritation and allergic reactions. 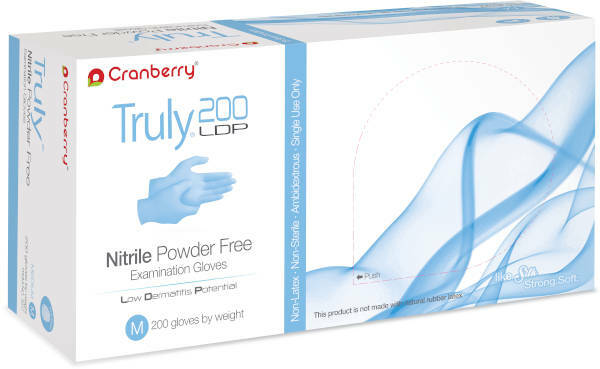 Allergic reactions to latex gloves have been attributed primarily to high powder and protein content.1 Made specifically to reduce the potential for types I and IV allergic reactions, Cranberry USA's Truly Nitrile powderfree, low-sulphur-content gloves are the industry's first FDA-approved nitrile exam gloves with low dermatitis potential and a 'chemotherapy drug tested' claim. Five in-house quality-assurance tests ensure greater penetration resistance to selected chemicals. No substances known to be harmful to the user or others contacted by the gloves are used in their chemical formulation, nor in the surface lubrication materials.